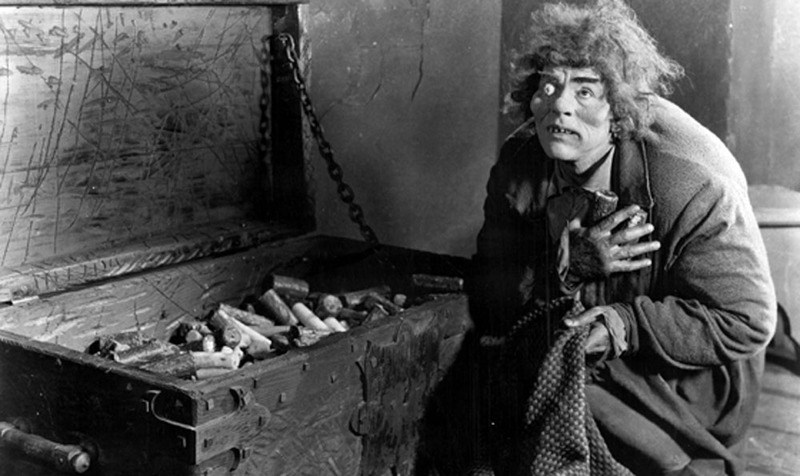 Lon Chaney is known in silent picture aficionados as one of this period’s great actors. His ability to literally disappear into a picture has become legendary. Even today many make up artists study his techniques and revel at his innovations. He wasn’t just an actor, he was a character actor. One of his most famous characters was Quasimodo from The Hunchback of Notre Dame. Quasimodo is a mostly blind, humpbacked little guy who was ridiculed throughout Paris during the fifteenth century. Only the priest of Notre Dame took pity on him and gave him shelter, food and an important job to do: ring the bells. From his high perch, he is able to watch the goings on in the courtyard of Paris. During the festival of Fools, a young gypsy woman emerges to dance for the public named Esmeralda. She is a beautiful creature and Quasimodo is immediately smitten. But Esmeralda has eyes only for a dashing solider: Phoebus. After Jehan, the evil brother of the good priest, tries to capture Esmeralda and have his way with her and employing Quasimodo as his henchman, Phoebus comes to her rescue and they fall in love. But Esmeralda is under the tutelage of a very evil and powerful man, Clopin. Clopin and Jehan are plotting a peasant revolt that uses Esmeralda as their scapegoat. Intrigue and high adventure ensue. I am sure if you were young in the nineties, you must have a passing familiarity for this story. That was because it was taken by Disney and cleaned up for children like myself to consume. Instead of Quasimodo being a hideous creature with a bad temper, he became a lovable cripple who sang about getting out of the church and loving Esmeralda. Instead of the enemies being both the corrupt controllers of the peasant majority and the ignorant king, it is one man who was forced to raise Quasimodo from a young age. Clopin becomes a sweet storyteller instead of a manipulator of Esmeralda and his fellow gypsy friends. In other words Disney took out all of the political overtones that both Hugo and Chaney chose to keep in and give the film a stronger emotional pull. Disney took the essence of the film and butchered it like they have with so many other stories before it. Chaney is easily the most interesting thing about this film. For the first five minutes we see nobody else but him and he is able to show off his skill. As a part of his research, he visited several people who had deformities and mimicked their mannerisms and distorted his body to make it seem like he was deformed as well. He did such a great job that is hard to realize that Chaney is actually close to six feet tall instead of four feet. The issue with this film comes when Chaney is no longer on the screen and Esmeralda is. The woman playing Esmeralda obviously does not look like a gypsy, but she also does not act like one either. She is essentially a Lillian Gish rip off. The mannerisms that Gish is known for works in D.W. Griffith movies, but it does not work in everything. Esmeralda is supposed to be a fiery, sensual and naive woman, but the actress is not able to fully land any of these traits. The first half of the movie is overloaded with long character introductions and exposition that it slows down our getting back to spending time with Quasimodo. In fact after the first five minutes, Quasimodo disappears for long stretches at a time, forcing us to watch relationships we don’t care anything about. I would watch this movie only if you are interested in the career of Lon Chaney, the man of a thousand faces. He is easily the stand out of the picture and it drags when he is not there to light up the screen. Be forewarned that the only surviving print of this movie is 16mm which makes the picture a little blurry even when it is artfully restored.